Kit, our newest boarder at Six Meadow Farm, has come a huge distance and yet in other ways has just moved down the road. Originally from some of the remaining wild horses in Oregon, Kit somehow made her way thousands of miles south to come to live on my neighbor’s property. Some years and bad times, brought Kit to her next turn in the road which was my farm right down the street. Horse lover Isabel made the decision with her family to aid and abet this little mustang mare who was seized by the sheriff’s office, then bound for the kill buyer, a crowded painful ride to Mexico and a brutal end in the unregulated slaughter house to be processed into meat. As my father always told me when I wanted to buy this horse or that horse, that it was not the price of the horse itself (at least back when he and I were buying horses) but the cost to keep it, care for it and provide for it for all the years to come. In the case of Isabel and Kit, there was no price to buy this horse. Our Pultar Road neighbors went out to the auction and waited most of the day to get this Mustang and a Quarter horse pony out of harm’s way, bidding back to back with kill buyer until the little horses were not worth their weight in meat (literally). Our neighbors brought them home to us. Isabel had done her research on how much the keeping and nurturing of the horse would cost her over a year’s time. But like most new horse owners, the minute Kit got off the trailer at our farm, one could almost visualize the bills starting to mount up. First, as Isabel assessed her, she saw a lot of scrapes and cuts. The sheriff had gotten the horses to auction too late to be auctioned with the horses and they were sent down the shoots with the frightened cattle. Our pony held up pretty well but Kit was a mess of torn flesh including a gash on her back leg. Kit’s feet were in bad shape as well. By Saturday the farrier arrived to help out Kit, but declined to work on her as he was concerned about her cut leg and the fever he felt sure was racing through her bloodstream. Nothing about this was good news to Isabel and her parents. Meanwhile, our pony Jete’ was starting to shine like a new penny, having her feet trimmed up and we were discussing who was going to ride her first. The comparison between to the two rescues had to make it even harder for Isabel to understand what in the world she had been thinking when she signed up to rescue the Mustang. To add a little more insult to injury, Isabel was now our employee, cleaning stalls, hauling feed and water and sweating, a lot. Most suburban teenagers do not have what it takes physically to knock out 14 stalls in 95 degree heat. But Isabel stuck with it. It was one more way to pay her Mustang’s board bill. Our pony went off with saddle, bridle and rider into the arena like they had just stepped into the show ring. While there were a few mistakes, the pony clearly knew what to do and had been well-trained. Meanwhile, Isabel followed up with vet to learn there was no temperature, the leg would heal fine but oh, boy did this girl’s teeth need some work! For those of you old enough to remember there used to be a series of books about a girl named Pippi Longstocking. Pippi could pick up a horse in one hand. She was super strong. I often think of our vet Lynn as the Pippi Longstocking of vets. As a female in the large animal industry, it has helped Lynn to smart, fast, lean and strong. Most horses are no match for her technique but this Mustang, was not letting anyone look at her teeth. A little medication later, the teeth were taken care of, but Lynn urged Isabel’s mom to get some PROFESSIONAL training help as her daughter could be hurt. More money out the door and it sounded like more was going to be spent. Meanwhile, our pony was on perfect ride number two over in the arena. I attempted to help Isabel with the bridling issue only to learn this Mustang mare was not planning on opening her mouth for me any more than she was for anyone else. I gave it a good try-but Kit won. We started talking about alternatives to traditional bridles like hackamores or bosals. I think Isabel was just watching money run out of her wallet. Originally, her plan had been to do some fund raising both at her school and on-line. Money was just trickeling in for the mare and her care. But I did see them make progress. The first days, the water hose sent Kit to outer-space but by this weekend she was quietly standing in the wash rack while the water ran full force. She had become quieter and easier to handle each day as well. In the dark before dawn as I brought the horses in to eat, I would put my pony away first. Kit stood calmly in the hallway until I was ready to walk her back to her food. The terror in her calls to our pony, Jete’ , the moment the pony disappeared from sight, reduced and started to cease as Kit became part of the mare’s pasture. I also think that it helped immensely for Caroline and Arianna to come by with pictures and stories of their Mustang, Ellie Mae, that many of you have seen on the show circuit. She is a glossy, beautiful mare who has won many blue ribbons in the ring. But Caroline showed Isabel pictures of Ellie Mae as she had arrived, skinny, banged up and looking nothing like the adorable mount she is now. This weekend I put together a hackamore (it works without a bit by putting pressure on the nose of the horse) for Isabel to try on Kit. As her father stood looking a bit concerned I urged Isabel to go ahead and saddle up Kit. We would go take a test ride. I had seen nothing in this horse to indicate she would be crazy or spooky as long as we left her teeth alone. Isabel eagerly agreed and we headed off to the arena. As I stood closely by and Hugh ran video on his phone, Isabel mounted the Mustang for what was probably the first time in at least five years. The little mare accepted Isabel on her back and walked quietly around the pen. It was a big first for the two of them. Lauren on Jete” and Isabel on Kit for the first time. 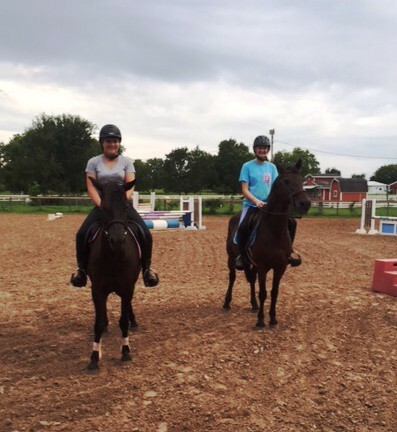 Last night both Lauren and Isabel saddled their ponies and they took their first ride out in the big arena. It was a pretty fine moment. Isabel has set up a “Go Fund Me” to help her offset the costs (and the continuing costs) of supporting her rescued Mustang. I know we have all been asked to support this and that cause and we probably could use money for our own horses. I have not used this blog as a fund rising vehicle in the past. But something about the determination of this 15 year-old girl to help save this Mustang has made me respect her grit, strength and vision. 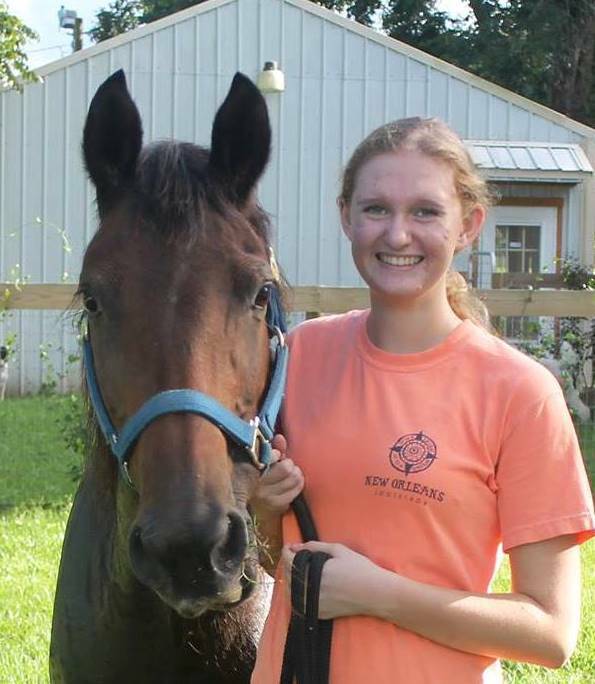 When she first heard about this mare in need she set out to devise a plan to help. I would ask you to help her help the Mustang. Let’s watch this mare blossom! As always, thanks for riding along! Send a dollar or ten if you can!